Background: Elevated levels of serum LDL and total cholesterol are considered important risk factors for the development of atherosclerosis. Cholesteryl ester transfer protein inhibition raises HDL levels and reduces atherosclerotic lesions. Objective: Consequently, there is a great interest in developing new CETP inhibitors. Methods: Herein, synthesis of four chlorobenzyl benzamides 8a-d that aim at CETP inhibition was performed. Results: Benzamide 8a showed the best CETP inhibitory activity with an IC50 of 1.6 µM. 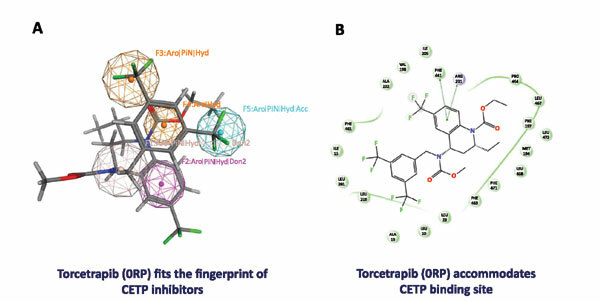 In vitro biological data shows that the presence of p-trifluoromethoxy group enhances CETP inhibitory activity more than m-trifluoromethyl groups. QPLD docking shows that the verified compounds accommodate the binding cleft of CETP and are enclosed by hydrophobic lining. The scaffold of 8a-d matches the pharmacophoric points of CETP inhibitors; particularly hydrophobic and aromatic functionalities. Conclusion: Future structural modification is needed to improve CETP inhibitory activity and to enhance understanding of the structure-activity relationship. Keywords: Atherosclerosis, CETP inhibitors, chlorobenzyl benzamides, docking, QPLD, pharmacophore mapping. Keywords:Atherosclerosis, CETP inhibitors, chlorobenzyl benzamides, docking, QPLD, pharmacophore mapping. Abstract:Background: Elevated levels of serum LDL and total cholesterol are considered important risk factors for the development of atherosclerosis. Cholesteryl ester transfer protein inhibition raises HDL levels and reduces atherosclerotic lesions.